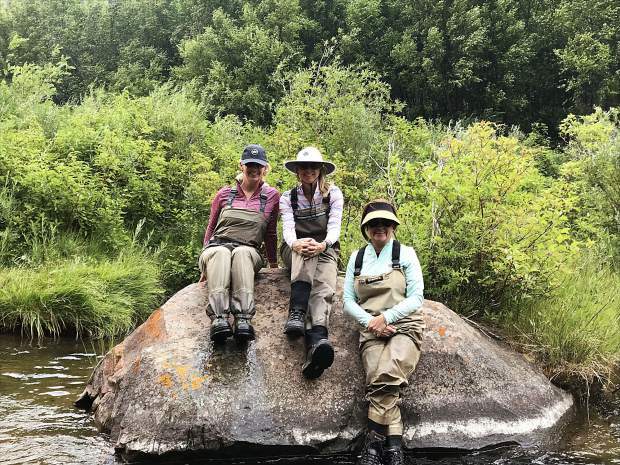 Three anglers on the Fryingpan River. Are your waders letting more water in than they are keeping out? All waders, regardless of the brand, will eventually leak. With all of the thistles, thorns and brush we encounter in a day’s fishing, it isn’t a question of if your waders will get pinholes, but when. Extending the life of your waders is easy — to a point. GoreTex waders cost more than most others but are a snap to repair, even on your own. The expense is justified once you realize how much more breathable and abrasion-resistant they are, as well. To find pinhole leaks in a GoreTex wader, simply turn them inside out and lay them on a flat surface. You can pick up isopropyl alcohol at any grocery store or pharmacy, and having a spare spray bottle helps, too. Lay the wader flat, spray it down with the alcohol, and watch the little black spots start to appear. The alcohol reacts with the material, showing you all of the tiny perforations. Once the leaks are identified, simply smear a small amount of Aquaseal (or your favorite hydrophobic sealant) on the spot, and repeat on both sides (front and back) of the wader. Waders made from other materials can be a little trickier but still repairable. The easiest way to identify leaks is to grab a flashlight and a marker, and head to a dark room. In the dark, move the flashlight around inside the wader and leave a mark with your marker where the light is showing through. You can then seal those spots, preferably on the inside as well as out. Leaks in the neoprene stocking foot require a different technique. Fill the wader foot with water, then compress and squeeze the leg down to the foot, which should start leaking water at the hole(s). Take note of the spot, and hit it inside and out with sealant. There is a point in any wader’s life that it simply gets beyond the beyonds. It always hurts a little, but then again, nothing beats a new pair every few years. Stay dry out there!